At Muluwa, a unique experience awaits, as you are surrounded by peaceful “plains game” wildlife that meander around the Likweti wildlife estate. Giraffe, zebras, nyalas and other soft game roam freely and are often seen around the various accommodations and the main lodge. The tallest land animal in the world is one of the most recognisable in the African landscape. Standing up to 5.7m high, over one-third of their height is made up of their uniquely long neck. Their tawny bodies are covered in dark brown geometric markings. Oddly graceful for their size, watching a giraffe walk around Muluwa peacefully as they do, makes it difficult to believe they can reach galloping speeds of 60km per hour. Although known mainly for their long necks, they also sport the longest eyelashes in the animal kingdom. Giraffes are social animals and move around Africa’s savannas and woodland areas in small groups called towers. Females form “nursery groups” where one cow is left in charge of the young while the others enjoy some time off from child rearing to eat. Adult bulls determine dominance by a method called “necking,” slamming their long necks into each other until one admits defeat. Did you know? An adult giraffe can eat up to 45kg of leaves per day; however, they don’t consume much water, drinking only once every few days. Sometimes mistaken for the kudu, the considerably smaller male nyala has a grey-brown hide, white vertical stripes and thick, yellow-tipped spiraled horns. Its female counterpart has a visibly different reddish-brown coat, resembling more of a striped “Bambi” in appearance. Nyala have more discerning palates than other antelope, preferring tender leaves, seed pods, fruit, flowers and tubers, which they dig for using their front hooves. Due to their specialised diet, they are not widespread. They are extremely shy animals and tend to stay hidden in thick vegetation, which has the added benefit of helping them escape detection by predators. Fortunately, there are no predators at Muluwa, so they can take it easy. The kudu is a true giant of the bushveld. Their grey-brown hides are marked with several vertical white stripes along the sides of their massive 210-kilogram bodies. Male kudu sport impressive beards and spectacular corkscrew horns – the longest recorded reaching 1.8m in length – making these majestic antelope one of the most easily recognizable in South Africa. Perhaps most well-known for the Great Migration in the Masai Mara, Blue Wildebeest is another of Africa’s well-known wildlife species. Their dark silver-grey bodies sport a mane which hangs from the throat and neck with faint vertical black stripes adorning the fore-quarters. Both males and females have short, thick horns which resemble those of the African Buffalo. Most often found in open grassland, herds can grow to include hundreds and sometimes thousands of wildebeests – especially during migration periods. They are most active during the mornings and evenings when temperatures are cooler, but can be seen grazing throughout the day. They are particularly fast runners, reaching speeds of up to 80km/h. Did you know? Wildebeest calves are able to run with the herd within minutes of birth. The Impala is one of the most common antelope on the plains of Africa. Medium in stature, their hides blend from dark caramel on their backs to off-white on their bellies. Rams have gently curved horns and can be heard throughout the day and night uttering loud snorts and grunts. Did you know? Impala males are great actors. If herds of females try to leave the boundaries of his territory, he takes a stance usually used to indicate danger to scare them back into his controlled area. No South African bushveld setting would be complete without the black and white stripes of the zebra. Although there are 3 different types of zebra (namely Plains, Mountain and Grevy’s), the one synonymous with South Africa’s grasslands (and the one you’ll see at Muluwa Lodge) is the Plains zebra. Their stripes are as unique as fingerprints – no two animals bear the same markings. Did you know? Zebras communicate their mood with their ears. If they’re calm, their ears stand straight up. They push their ears forward when frightened and pull them backward when they’re angry. While most visitors come to this part of the country to enjoy South Africa’s big game, a whole world of feathered creatures hover above the hazy plains of Mpumalanga. 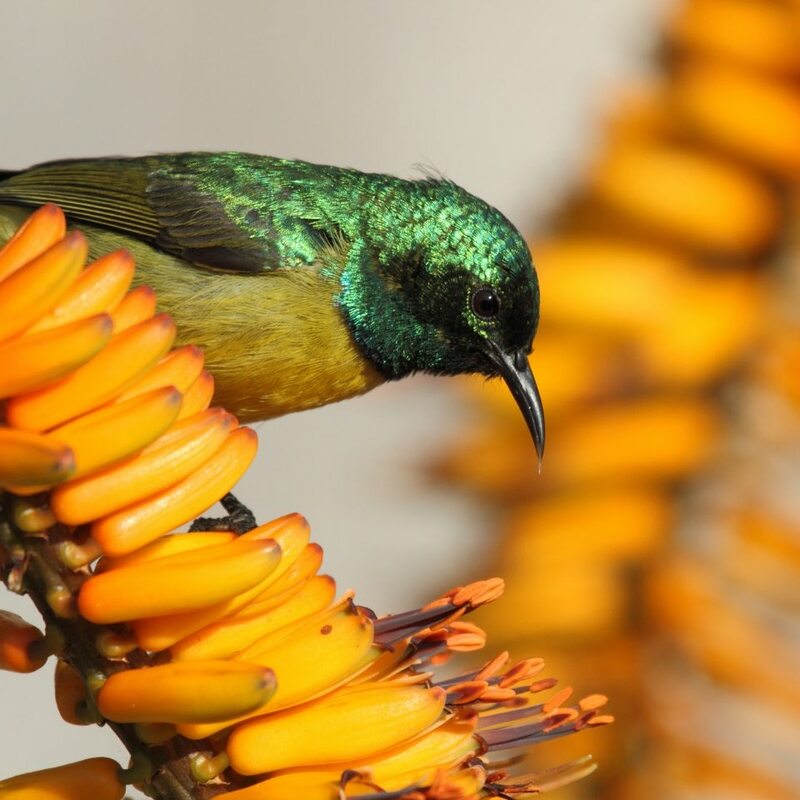 The area provides mixed bushveld – combinations of flat savanna and woodland – providing bird watchers an opportunity to view a smorgasbord of birdlife. 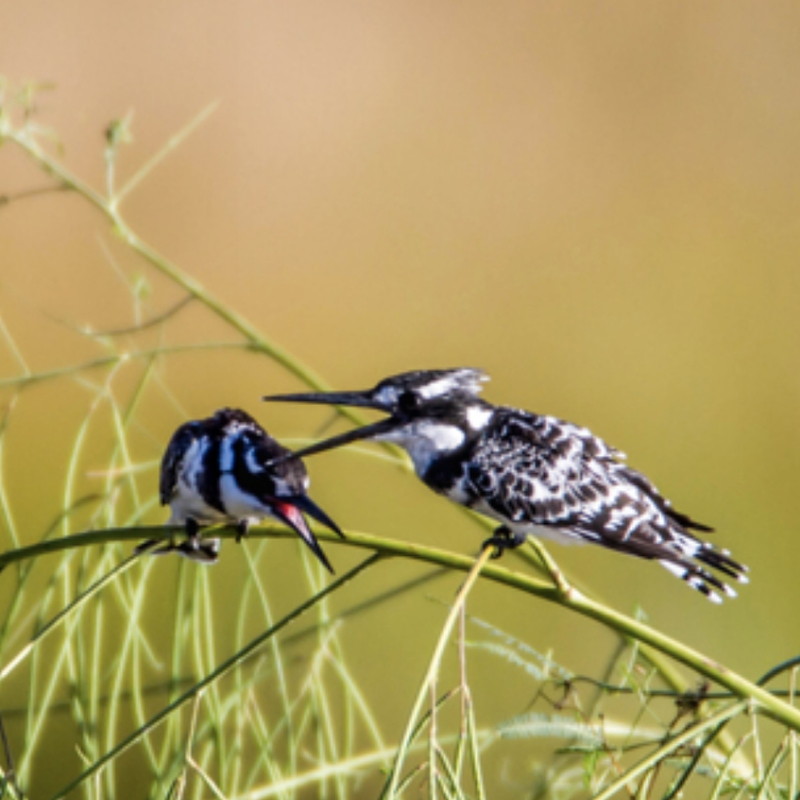 The Kruger Park is the perfect place for birders to truly experience some of the best of South Africa’s birdlife. Here at Muluwa, you can also catch a glimpse of many beautiful birds; it’s easy to lose track of time as you while away the hours in the Mac Hide or taking a stroll around the grounds. A variety of birds are often seen from the deck of your accommodation or the main lodge too. 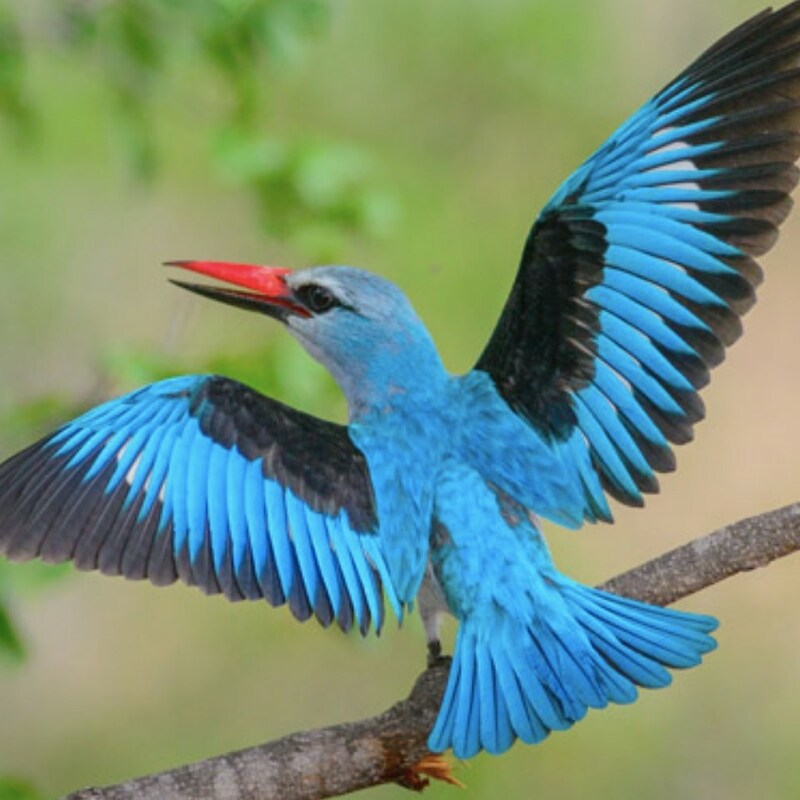 Birdlife includes various Eagles, Flycatchers, Hornbills, Kingfisher, Sunbirds, and many others. We have recorded over 200 species of birds on the estate.